REGISTRATION OPEN SOON FOR THE 2019 LOWCOUNTRY PARADE OF HOMES TOUR! The Parade of Homes will take place March 29-31, 2019. 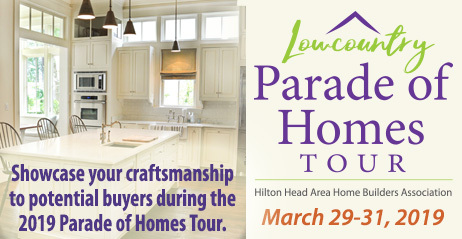 Held in conjunction with the Lowcountry Home & Garden Show and produced by the Hilton Head Area Home Builders Association, the Parade of Homes Tour is the Lowcountry's largest annual showcase of newly built and remodeled homes. The annual Parade of Homes Tour is a self-guided, scattered-site tour featuring homes and communities on display throughout Hilton Head Island, Bluffton and beyond. Tour Guide with directions, maps and gate pass will be available for purchase soon!